Golden baby Hasselback potato sliders with a light crisp exterior and soft sweet centre make a perfect accompaniment to any main course. It's like having chips or roasties without all the guilt. I'm a big potato fan and these baby Hasselback potato sliders are not only one of my favourites, they're also a firm family favourite too. The principle is that the potato, whilst retainling its wholesome skin is partailly sliced but remains joined at the bottom. 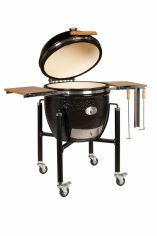 As the potato roasts, it fans out which speeds up the cooking and helps create the crispy exterior. I've just seasoned mine with salt, pepper and herbs, added the magic of roasting them on the baking / pizza stone of my Monolith kamado grill and we have a heavenly result. Texture and taste-wise it's like a cross between a potato crisp / chip and a baked potato. The concept originates from Restaurant Hasselbacken, Stockholm, Sweden, a restaurant and hotel that dates back to the 1700's. 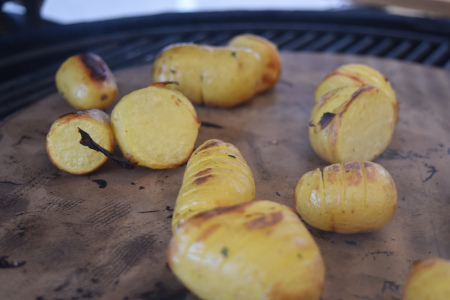 It wasn't however until the 1950's when Hasselbackpotatis first appeared on the menu; some attribute the creation to a trainee chef Leif Elisson in 1953, others to the principle of the restaurant cookery school a little later in 1955. Like much culinary history I guess we'll never know the exact truth but that doesn't mean we can enjoy them just the same. I used baby Charlotte and they worked a treat. That said I did have 2 major challenges that took me a while to work out so I'll share them here to save you the time and effort. The first was finding an easy way to slice the potatoes and get them to fan out so that I could crisp the skin. I solved this with a special Hasselback potato slicer and a two step approach to the cooking process (explained in the method statement). The second challenge was how to stop the potatoes from burning. I originally started with indirect heat in my Monolith kamado and a foiled baking tray on the 2nd tier grill grate but I found that the potatoes just burned too easily. The solution was to use the pizza stone positioned also on the 2nd tier grill grate over indirect heat. Not only did they not burn so easily but I also found that the pizza stone added colour to the final result. Preheat your barbecue to 200°C (390°F) and set up for indirect cooking. For kamado cooking that means having the heat deflector stones in position. 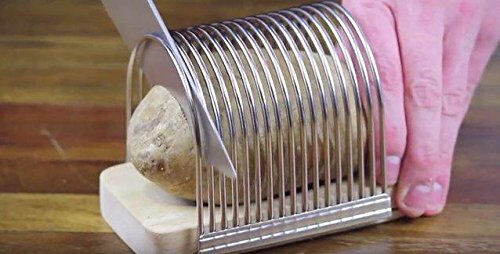 Using a knife and Hasselback potato slicer, slice the potatoes almost all the way through but leaving the potato intact at the bottom. When done, place the potatoes in a large bowl, pour over the salt flakes, black pepper, thyme leaves and the olive oil. Now get your hand in and move everything around to ensure that the Hasselback potato sliders are coated on the outside and inbetween the slices. Lift the potatoes out and place the cut side up on the cold pizza stone and then place them in your grill for 30 minutes with the lid closed. Don't discard the remnants of your mixing bowl just yet. When the 30 minutes are up, open the lid to your grill and you'll see that the potato slices have started to separate. Move the potatoes around a bit to ensure that you get colour all over, sprinkle over the chopped garlic, throw on the sprigs of thyme and drizzle any remaining olive oil from your mixing bowl into the potato slices. Close the lid of your grill and roast an additional 25-30 minutes, or until soft and golden brown.